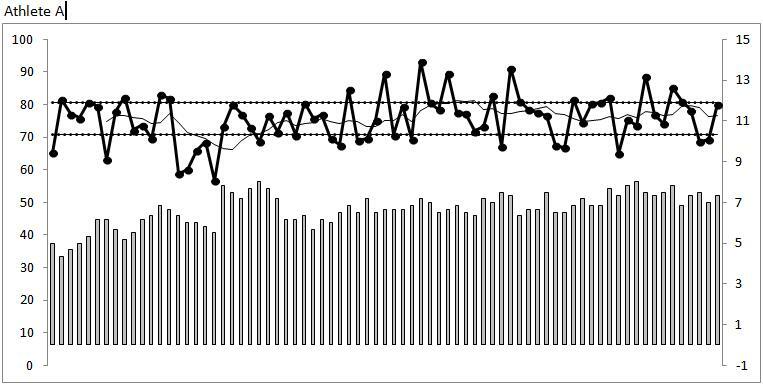 Below are the HRV trends of two NCAA D1 athletes from a team we’ve been working with over a 3 month period of virtually the same training schedule. HRV and wellness was acquired daily by the athletes with the ithlete finger sensor in the seated position. Interestingly, these two athletes have very similar responses. About 3 weeks into the trend was a very intense training camp that was held out of state before Christmas. One athlete appears to experience more fatigue than the other with nearly the whole week below the SWC and a more pronounced decrease in wellness. HRV and wellness for both athletes improve over Christmas break. Following Christmas there is an intense 2-week training period followed by a reduction in training load. Both athletes frequently fall below the SWC here. Athlete A oscillates up and down while Athlete B remains below the SWC for nearly an entire week along with a decrease in wellness (middle of the trends). Both athletes trend upward after the intense training period and remain steady throughout the last half of the trend. What makes things interesting is when athletes do not respond as expected. This is when the monitoring becomes invaluable as training intervention becomes extremely important. This entry was posted in Uncategorized and tagged athlete monitoring, Case Study, data, heart rate variability, HRV. Bookmark the permalink.